Folklore hero Badang, portrayed by actor Rizman Putra Ahmad Ali (above), "flies" over his enemies including 600 warriors armed with bamboo poles, shields and fire torches. While the show theme was about building the future, this ancient legend of the strongman associated with the Singapore Stone also took centre stage during a recap of Singapore's colourful history. A close-up view of one of six fire performers in the first act of the show, as he goes through his paces during the last preview. Along with 600 "warriors", the fire performers take on strongman Badang in a fiery display of shimmery costumes and choreographed battle scenes. Actor Rizman Putra Ahmad Ali may have played Malay folk hero Badang, a man of super strength, at this year's National Day Parade, but he considers himself "shy and reserved" in real life. "He is the go-to person when you're in trouble... a leader... 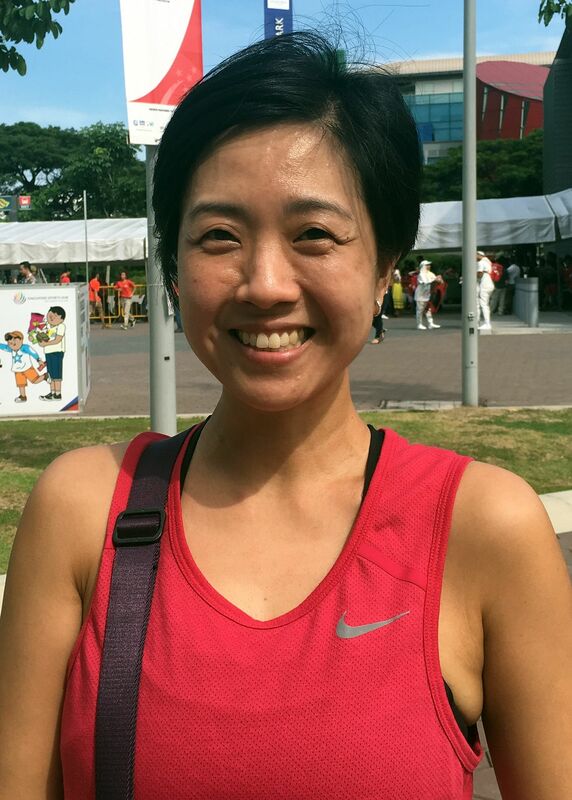 I'm a normal person in real life," said the mild-mannered 38-year-old in an interview with The Straits Times before Aug 9. But last night, Rizman transformed into Badang, whom he calls "our own superhero". According to folklore, Badang was a village fisherman who defeated a water ghost. In return for its freedom, the ghost promised to grant Badang any wish. Badang wished to become stronger than any other man and the ghost agreed - on the condition that he had to eat whatever it threw up.The wish was granted. He used his power to help his villagers and was later made a court warrior by the king of ancient Singapore. His fame spread far and wide. In a duel with a strong man from another kingdom, Badang lifted a giant boulder that had been sitting on a hill for centuries and flung it into the sea - it landed at the mouth of the Singapore River. A fragment of the rock, called the Singapore Stone, now sits in the National Museum. The National Day Parade was held at the former National Stadium for the first time in 1976. More than 65,000 spectator swere there to take part in the celebration. Transport to the new stadium is now very accessible and convenient. About 25 years ago, we had a film shoot for a show at the stadium – and we had to walk a long distance to get there. 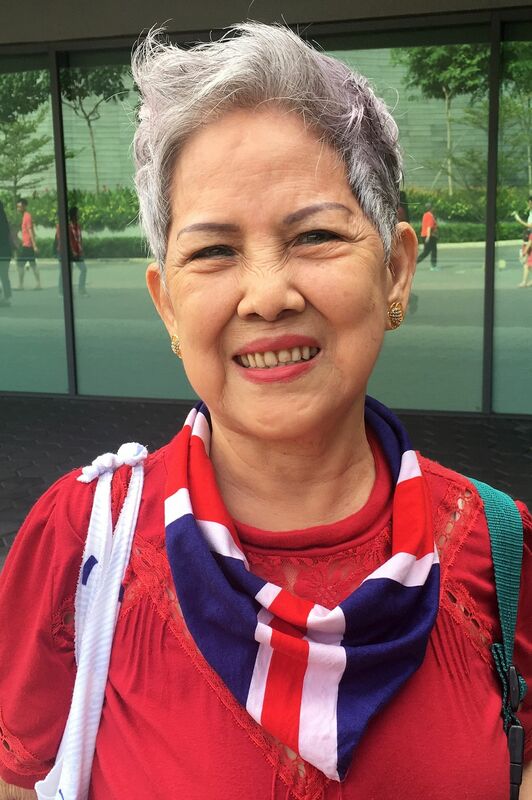 RETIREE MAGGIE PEH, 78, whoused to act a san extra in several TVshows. The best moment was the year Singapore won the Cup– the crowds were fantastic and my friends and I waited outside the stadium after games so that we could catch a glimpse of the Lions. SHIPPING SPECIALIST SHAHIZAL SAMAT, 40, who watched the Malaysia Cupat the old National Stadium. 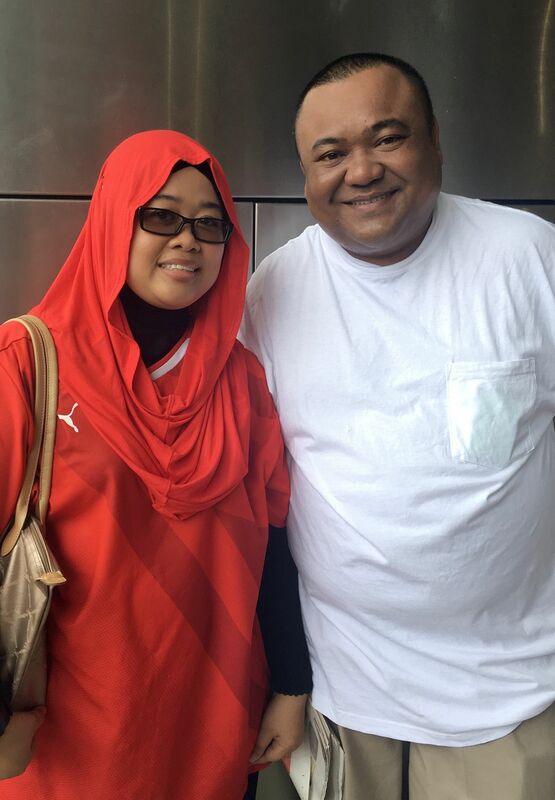 Also pictured is his wife, Madam Sariah Kamarudin, 35. Rizman, who brought Badang to life, is experienced in physical theatre - which emphasises the use of physical movement, as in dance or mime, for expression. The visual artist-turned-theatre practitioner also sings in a band and has taught drama and dance, as well as directed plays in the past 22 years. "It's a dream come true," he said of playing Badang. A Peter Pan fan as a child, he said: "I've always wanted to fly when doing a performance. I think it's very surreal." Overcoming his fear of falling, he soared to around 30m in the National Stadium yesterday, shattering a "giant boulder". Rizman, who watched old Malay films about Badang as a child, hopes that this "unheard tale" will encourage more youth to dig deeper into local heritage and culture. "I think it's a very important tale but people have forgotten all about it. It will create conversation for two generations, perhaps," he said. It certainly did for his family members, who were surprised and proud when he told them about his role in the NDP. Rizman hopes to inspire his audience with the Singapore Stone story. He said: "It's about strength, resilience and courage. We need all of that as individuals - the times now are very testing." He added: "I think there's Badang in each and every one of us... You have to be brave, be fearless, face the world on your own sometimes, face all the challenges."